These are stones that tell stories. Hampi is made of rocks that were finely chiseled into beautiful structures by the Vijayanagara Empire that made Hampi their base. It shows off towering temples and palaces that appear stern at first glance. Enter them and be transported into the era where elephants were adorned with jewels, courtesans danced, the royal women frolicked while protected by watch towers and gods had magnificent temples crafted to perfection. Hampi is set in the huge valley spanning the banks of the Tungabhadra River and is undoubtedly home to one of the largest temple complexes. As you stand amidst its ruins, you can almost imagine the precious stones that must have once fitted these structures. And then it does not come as a surprise why Hampi was then declared by the UNESCO a 'World Heritage in Danger'. Getting around in Hampi is not that tough, and you can hire auto rickshaws and private taxis. Check with your hotel reception, though, for rates and fare methods. Public buses are also available, though you could avoid them if necessary. We recommend exploring the city on foot so as to see all treasures of this city. Virupaksha Temple: This 5th-century temple located in Hampi Bazaar is one of the most recognized structures of Hampi. The temple is dedicated to Lord Shiva as Virupaksha and his consort, the local goddess Pampa. This is one of the finest examples of Vijaynagara architecture and this is evident from the 9-tiered eastern gateway, which at 50 m is the highest. The temple houses shrines dedicated to the gods, a pillared hall and the Ranga Mantapa, which is an open pillared hall. This open hall has close to 38 pillars carved intricately as a mythical lion, with the base having typical Shaivite carvings. The central ceiling is massive in size and is beautifully adorned with bright paintings from Ramayana, Mahabharata and the puranas. The entrance of the temple has the Virupaksha market, which is flanked on one end by the Bistappa’s gopura and the image of Nandi Bull on the other. A large image of Narasimha (6.7 m high), the half-lion, half-man is seen seated under a canopy of a seven-hooded snake as well as a huge linga. Another interesting shrine within the temple is that dedicated to Goddess Bhuvaneshwari, which is especially noted for its carved doors, pillars and finely chiseled panels. Vijayavitthala Temple: This is by far the most splendid temple complex you’ll see in Hampi. Dedicated to Lord Vishnu as Vitthala, it is built in typical Dravidian architecture. The hall is created with pillars and the small sanctum houses the idol of the deity. Note that only the main priest is allowed in the sanctum. The temple is flanked by 3 gateways, and the base is heavily carved with the kings army and dancing girls. A special highlight of this temple are the 56 musical pillars, which produce music when tapped. This is however, discouraged to prevent further damage. The Vitthala Temple is home to the exquisitely carved Stone Chariot, which is actually a miniature temple. It is crafted to resemble the chariot on which idols are taken out in a procession. Hazara Rama Temple: This derives its name from the Ramayana panels that adorn the walls. Believed to have been the original temple of the royal family, the external walls have intricate bas relief that narrate episodes from Ramayana. The pillared hall within has beautiful pillars done in black stone. The temple is not in use anymore, though you can visit it to see the shrine dedicated to Devi. The walls of the complex are carved both from within and without. The outer walls depict horses, elephants, dancing girls and infantry in procession; the inner walls showing scenes from Ramayana. Elephant Stables: Adjacent to the Zenana Enclosure this huge stable is a beautiful example of Indo-Islamic style of architecture. This grand building housed 11 rooms, out of which 10 are adorned with high domes. This was, quite obviously, home to the ceremonial elephants used by the royal family on special occasions. Archaeological Museum: Located in the Bellary district adjoining Hampi, it houses a collection of artifacts of the Vijayanagar Empire. It is divided into three galleries and a sculpture gallery. Popular displays include sculptures dating to the Shaiva faith including Shivalinga, Nandi and Dwaramantapa, arms, brass plates, gold and copper coins, iron objects, limestone Buddhist panels, Jain Thirthankaras and scultures of Ganesha, Hanuman, Lakshmi and Garuda. Queen's Bath: This is one of the best-known structures of Hampi built in true indo-sarasanic style. It is a square structure bounded by arched pillars and arched balconies that project over the bath. This was used by the women of the royal household and water was supplied by pipes. The bath has lotus-shaped fountains that once sprouted perfumed water! Lotus Mahal: Quite obviously, it is shaped like a lotus flower and is a 2-storey structure complete with beautiful archways. Created in indo-Islamic architecture, the lower level was apparently used for recreation and music concerts. The structure is flanked by a high watchtower and has an elephant stable within. Tula Bhara: Located close to the Vitthala Temple, this was essentially two high carved granite pillars supporting a 12 ft high stone beam with three hoops on the underside. This king’s balance was used to weigh the kings on special occasions like the coronation day against precious diamonds, gems, gold, silver and grains, which would then be distributed among the poor. Sasivekalu and Kadalekalu Ganesha: These are two huge stone idols of Ganesha, located on the Hemakutam Hill. The Sasivekalu Ganesha is about 2.4 m high and is also called, believe it or not, mustard seed Ganesha. Seated in a round mandapa, the idol is shown holding the ankusa, broken tusk and a looped pasa. Similarly, the Kadalekalu or groundnut Ganesha is also a 4. 5 m high monolith idol carved out of a massive boulder. Stepped Tank: This is a recently excavated tank made of black stone. A relatively small, but ornately done tank, it is accessible by 5 tiers of proportionately fitted steps. Water to this tank was drawn through a stone aquaduct which is also preserved today. Ugra Narasimha: Carved out of a single granite boulder, the statue of Narasimha is 6.7 m in height though not much of the original grandeur remains. He is seated on the coils of the serpent Adishesha and is portrayed with bulging eyes and broad chest – a terrifying countenance. The original statue also had Lakshmi seated on his left leg, though this was destroyed long back. Daroji Sloth Bear Sanctuary: Located close to Hampi, this is a relatively new sanctuary housing the endangered sloth bears. While you are assured of a glimpse of the tiger, hyena and deer, sights of the sloth bear are not guaranteed since they are largely nocturnal and essentially camera shy! However, get in touch with the forest authorities, who have their own way of getting them out of their habitats for a quick glance. Hampi is no gourmet paradise and the food here is pretty much the usual South Indian fare. A few eateries and cafes line the main bazaar, some part of the guesthouses, catering to a range of cuisine including Indian, Chinese and Italian. Visit the Geeta River View Restaurant which is a quiet outdoor spot that serves excellent Indian fare. Do try out their pakodas (rice-flour fritters). Vicky’s is a cozy restaurant that serves good food and has a great atmosphere. One of the most popular and welcoming restaurants of all is the Mango Tree Restaurant. Located about 400 meters to the west of the main bazaar, this little cafe sits under a big mango tree. With an excellent view of the river here is where you can indulge in some multi-cuisine dishes. Venkateshwara is another popular eatery and Ranju Restaurant serves both Indian and continental fares. Their hot chilli bhajji is particularly popular. Remember that most restaurants serve a vegetarian fare due to Hampi’s religious significance and alcohol is not permitted. 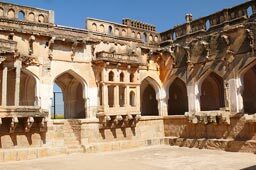 Quite obviously, don’t expect swanky shops and malls – Hampi is known for its temples and ruins, and you will, at best carry home amazing photographs. However, considering the spur in tourism, Hampi has some little shops that have sprung up selling souvenirs and handicrafts. Here, you will find some bags, jewellery, idols, postcards of temples and paintings. Hospet has some shops selling fabrics and handlooms, and these are available at the Andhra Handloom House and Karnataka Handlooms. Hampi Festival is held in November organized by the State Government and is marked by dance, drama, music, puppet shows and processions. The festival is held to celebrate the glorious past and the grandeur of the ancient Vijayanagar Empire. For those who are fond of traditional shopping there isn’t a better place than the festival itself to get some of the best buys. Purandara Festival is held in January-February in the Vittal temple. The festival celebrates the birth anniversary of the medieval poet-composer, Purandar. No swanky places to stay in, but quite a few decent options. Some guesthouses come with air conditioned rooms and home-cooked meals. Among these, try the Rahul Guest House, Padma Guest House, Shanti Guest House and Kishkinda Resort. Some of them wouldn’t mind organizing Hampi tours also! Close to the ruins is the KSTDC Mayura Bhuvaneshwari, which also organizes sightseeing tours. Hospet, 13 kms away, has some interesting options, all budget though. Try Hotel Malligi or Hotel Nag­arjuna Residency, which come with attached restaurants. Air: Belgaum at 270 kms is the closest airport and connected frequently to Bangalore and Mumbai. Hire a bus or a taxi to reach Hampi. Rail: Hospet is the nearest railhead located at 13 kms. Hire a private cab or take the bus shuttle to reach Hampi. Road: Quite a few KSRTC buses plying between Bangalore and Hospet. Alternately, you can hire a car or a luxyry bus. An interesting legend of how Hampi got her name goes thus: Pampa, the daughter of Brahma meditated atop the Hemakuta Hill to get Lord Shiva as her husband. Shiva granted her the boon and she married Virupaksha, Shiva manifestation, hence he got the name Pampapati. From Pampa came the name Pampe or (in Kannada) Hampe, hence the name.